Made for Brüdern vom Stain. 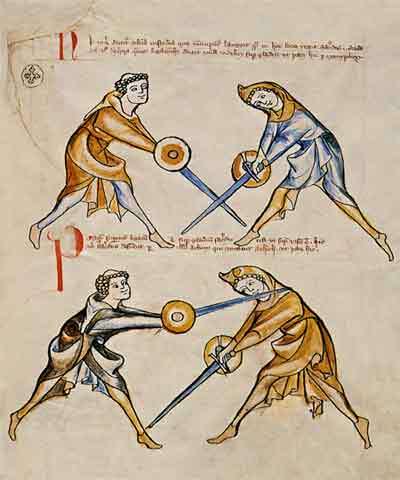 This edition covers siege weapons, longsword, buckler, dagger, grappling, pollaxe, mounted combat, judicial duels and a lot of other miscellany. Contains copy of Belliforts by Kyeser and Hier Lert by Ebreesch. Paulus Kal was serving Ludwig, Duke of Bavaria. Two separate manuscripts from the 15th century, bound together in the 16th century. Most of it deals with topics not, or only relatively related to fencing. This manuscript is actually Cracow version of Gladiatoria, and is not lost. It was moved from Berlin Library after 2nd WW to Cracow. The dating is also wrong. Contains more manuscripts, the oldest dating from the second half of the 15th century, or possibly even earlier. Possible co-authors: Michael Bauman, Paulus Hector Mair and Albrecht Dürer. Made for Leutold von Köngsegg. Hans Wurm is actually the printer of the treatise. The author remains unknown. A collection from various masters, including Martin Siber.